Chromite is the most important ore of chromium from which it derives its name. Chromium is an important metal and has a wide range of industrial uses. 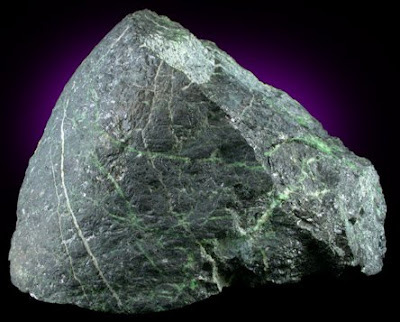 Chromite forms in deep ultra-mafic magmas and is one of the first minerals to crystallize. It is because of this fact that chromite is found in some concentrated ore bodies. While the magma is slowly cooling inside the Earth's crust, chromite crsytals are forming and because of their density, fall to the bottom and are concentrated there. ZAMBOANGA DEL NORTE, Philippines - The 54-year old Arlene Ogoc may not fully understand what is going to be mined in Danao in Sergio Osmena town, but she welcomes the entry of a mining company in her village here. “As long as it gives us the opportunity to earn a living and will be good for our community, I am in favor of their entry,” the 54-year-old mother of five said in dialect. Like the rest of the residents of the village, her family earn their daily living by tilling a parcel of land in the village without knowing that their farms are sitting on a mineral deposits due to be mined by Maharlika Dragon Mining Corporation (MDMC). The woman may have not hoped in vain. “Small time or the so-called camote mining is not within the interests of our company where mining companies will just come to the area and extract the mineral deposits and leave,” the company president declared. “Our company is into job creation to the community and seeks to add value to mining products in all our operations,” he stressed. MDMC is an affiliate of Century Peak Metals Holding Corporation (CPMHC), a publicly-listed company with the Securities and Exchange Commission. “Responsible mining is the guiding principle of our operations,” said MDMC business partner Wu Xiliang, adding that the company is pro-environment and pro-people and that if the company gains from its mining activities, the community will gain more. Among its mining records is Mineral Production Sharing Agreement (MPSA) No. 010-92-X and a large-scale ECC-0707-017-2140 issued in November 29, 2007 over 1,198 hectares in Sitio Marayag, Barangay Panamaon, Loreto, Dinagat province. It is also the holder of MPSA 283-2009-XIII covering 3,188 hectares in Albor and Libjo, Dinagat Province. In the locality, the company is the holder of an approved MPSA denominated as MPSA 333-2010-IX covering an area of more than 7,868 hectares where chromite ore will be the main product. It is also to put up a multi-million peso mineral processing plant in the area. “We ask the company to provide a concrete measure for reforestation in areas affected by their operations,” the mayor explained. Sergio Osmeña Sr. is a 2nd class municipality in the province. According to the 2000 census, it has a population of 27,500 people in 5,373 households. It has 39 villages. “I am happy that the company has agreed to this very important provision to protect the environment,” he said. The same optimism was echoed by former congressman Romeo G. Jalosjos, Sr.
“But I can guarantee you that with MDMC it is different. I see in this company as a true investor that also practice responsible mining,” the former congressman said.